Captain Kidd has gone down in history as America's most ruthless buccaneer, fabulously rich, burying treasure up and down the eastern seaboard. But it turns out that most everyone, from novelists to scholars, has the story all wrong. Captain William Kidd was no career cutthroat; he was a tough, successful New York sea captain who was hired to chase pirates in the 1690s. His three-year odyssey aboard the aptly named Adventure Galley would pit him against arrogant Royal Navy commanders, jealous East India Company captains, storms, starvation, angry natives, and, above all, flesh-and-blood pirates. 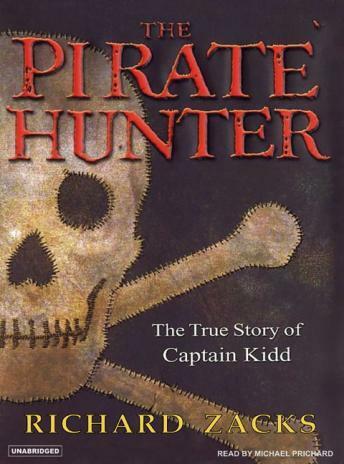 Captain Kidd found himself facing a long-forgotten rogue by the name of Robert Culliford, who lured Kidd's crew to mutiny not once but twice.Through painstaking research, author Richard Zacks has pieced together the never-before-told story of Kidd versus Culliford, of pirate hunter versus pirate, as they fought each other in an unscripted duel across the oceans of the world. One man would hang in the harbor; the other would walk away with the treasure. The Pirate Hunter delivers something rare: an authentic pirate story for grown-ups. The book is quite informative if you are really into pirate history and activities. My opinion though it that the exploits of Kidd were overshadowed by so many others and especially minutia. If one wants to know more than the average person of piracy and privateering of that era, get the book. My bottom line assessment is that it is much to long, especially considering the ultimate end. Seems like exactly what a book-on-CD should be. Interesting subject, well written and read. Long series but I am engaged enough to want to finish it. I've never been one to be passionate about pirates. However, after reading Master and Commander, I decided to give this book a try. Boy, was I surprised. This book is fantasticly written and excellently narrated. Captain Kidd's story is truly remarkable and Richard Zack's painstaking retelling from the ostracized captain's view is gripping. It had me reluctant to leave the car when I finally got to work.I highly recommend this book if you are interested in maritime history.